Chocolate desserts are always a family favourite and this recipe is no exception. Delicious chocolate and cherry dessert style cake and a thick luxurious chocolate sauce - ideal for family celebrations and dinner parties. This dessert can take a little while to prepare but is well worth the effort. Preheat oven to 170 degrees C, gas mark 4 and lightly butter an 8 inch cake tin. Place a bowl over a pan of hot water and add the chocolate pieces. Allow to melt slowly and add the butter stirring until you have a smooth sauce. In a large mixing bowl place the flour, bicarbonate of soda, cocoa powder and sugar breaking up any lumps. Add the eggs and mix well followed by the chocolate and butter mix. If the mix is still too stiff add some of the milk or all if necessary until you have a runny consistency. Pour into the cake tin and place into the middle of the preheated oven for one and a half hours or until a skewer comes out clean when inserted into the cake. Remove from the oven and turn out the cake onto a wire cooling tray. Break the chocolate into small pieces and place in a heatproof bowl. Put the cream into a small pan and heat gently. Tip this and the sugar over the chocolate pieces and stir until creamy and chocolate has melted. Add the rum. Carefully slice through the cake twice making three pieces. On the first piece add a generous layer of the chocolate mix followed by half of the cherry pie filling. Place the next layer of cake on top and repeat the process. Add the top layer of cake and decorate with the fresh cherries. Add the ingredients into a small saucepan and stir until thick and creamy. Serve immediately. Slice the cake into generous portions and serve with individual jugs of hot chocolate sauce. An alternative and tasty sauce can be achieved by slicing two mars bars into a heat proof dish and placing into a microwave oven. This only takes seconds to achieve and just need a quick stir to amalgamate the chocolate and toffee. 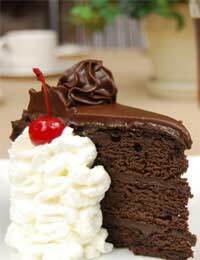 If you wish to have less of the chocolate filling inside the cake retain half of it to cover the cake before adding the fresh cherries. The cake can be made in advance of the meal leaving just the hot chocolate sauce to be prepared when required.